Last New Year’s some friends of ours invited us snow camping for the holiday. Since it was a last minute thing, and we really didn’t have the gear for it, we declined. Ever since we’ve been planning this year. Yosemite got a nice helping of snow over Christmas so I was eager to get there while it was still on the ground. Yosemite Valley is only about 4000 feet above sea level so the snow often doesn’t last long. We left on the Tuesday after Christmas and ended up spending 5 days in the valley. One hour out of Sacramento I came to the startling conclusion that, in all of my packing frenzy, the sleeping bags were still in the closet (at home). It was late enough in the day that it would have meant an after dark arrival if we had to head back so we drove on. My wife grabbed her phone and starting searching for a sporting goods store. We found the Sierra Nevada Adventure Company, in Sonora. It turned out to be a really nice store and we bought two new, 0F degree, bags. In retrospect it all turned out for the best. The sleeping bags that I left at home were only rated to 20F. The weather got colder than we’d expected so I have a feeling we wouldn’t have been nearly as comfortable as we ended up. From a photographic perspective the conditions could have been better but we still had a nice time and I got a few shots that I’m quite happy with; they’re in my Yosemite/Winter Gallery and are marked “New.” Clear blue skies are nice for tourists but clouds generally make for better images. Friday we finally got the clouds but they contained some pretty heavy rain during the afternoon. We stayed dry, warmed up some stew and made the best of it. This image was made from the shore of the Merced River. To get there we parked near Ahwahnee Meadow, strapped on the snow shoes, and started following the river. As it turned out we could have parked much closer but the walk was very pleasant. Taken in the morning, the top portion of this scene was a little “hot” so I brought it down with a 2 stop soft graduated neutral density filter. The file was converted in Lightroom and then brought into Photoshop CS4 for some dodging, burning and sharpening. It was taken with my Canon 5D using my Canon 24-70 f/2.8L lens at 40mm. Exposure was 1/3 at f/16 and ISO 100. Cheers and best wishes for a happy and prosperus 2009. 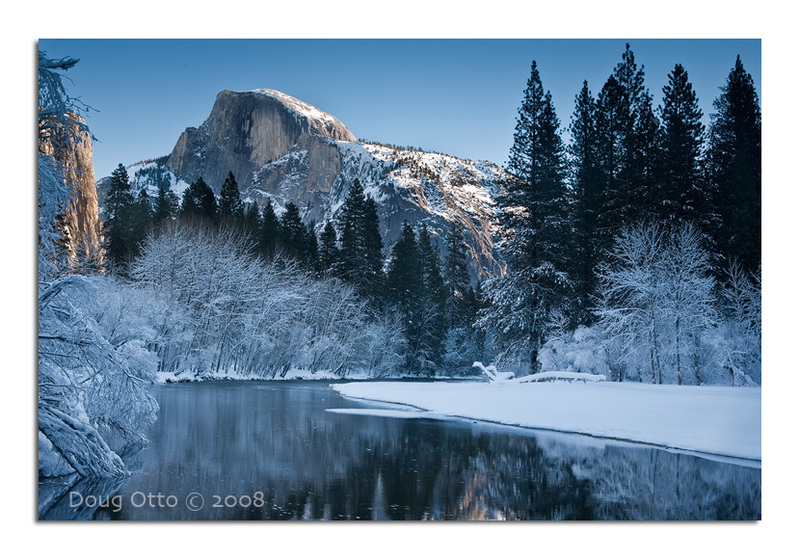 This entry was posted in Photography, Travel and tagged camping gear, half dome, snow camping, yosemite. Bookmark the permalink.